If you like making avocado toast, but also want to be able to afford a house one day, look no further than “Hyde Park Avocado,” the premier avocado price index for the Hyde Park area on Twitter. Since its inception, Hyde Park Avocado’s follower base has grown to nearly 450, and users have sent in pictures and reports of the latest avocado prices at local supermarkets like Whole Foods and Hyde Park Produce. We slid into their DMs to get the story behind the account. Chicago Maroon: Who are you? Hyde Park Avocado: I am the anonymous hero that avocado-loving millennials need in Hyde Park. I think it's really funny that I'm this anonymous, neutral-good force that only reports the price of avocados.… It's really funny to see all these people that I only know from a distance retweeting my tweets and sending me price updates even though we've never met in real life. CM: What is the lowest price you've seen for avocados in Hyde Park? HPA: The lowest price I've seen was two for $1 at HPP last winter. CM: Why do you run the account? Why did you make it? HPA: Avocado prices fluctuate seasonally pretty aggressively, and I thought it would be funny to track them. This account predates the avocado toast episode, but I feel like, to some extent, avocados have become a rallying symbol for millennials. This account is also pretty strongly for the memes. CM: What is your favorite way to eat avocados? HPA: I personally don't even eat avocados that much, but my roommate eats avocado toast on the regular so avocados are still a fairly large part of my life. HPA: [Avocados are] important to the life of almost every college student in Hyde Park, but also important to lots of other people in the area. Someone asked me to branch out to berry prices a while ago, and while I think that's valuable (and considered starting a sister account), I wanted to focus in on one thing, and I had already chosen avocados. HPA: I wish I had kept a spreadsheet of all the avocado prices so I could make cool visualizations. I like to add flair to the price report (and I think my followers like it too), so in order to mine all the avocado price data out of my tweets I think I would have to do it by hand. 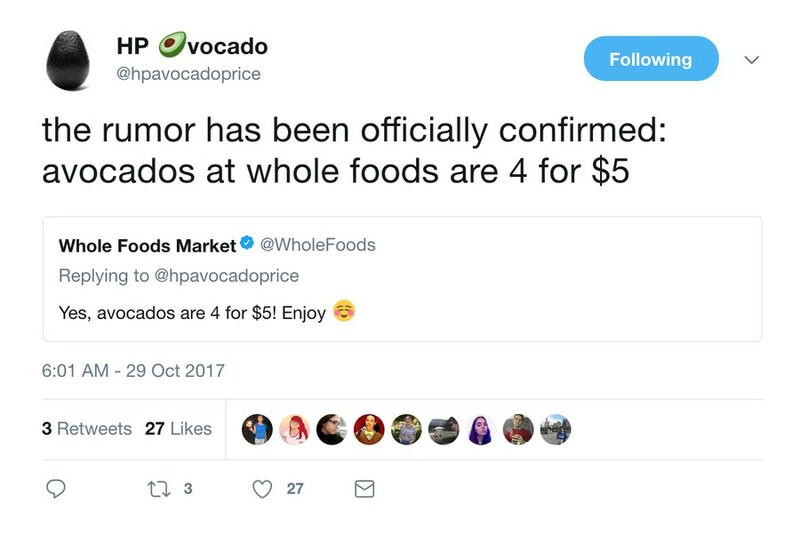 If you are interested in staying up to date on avocado pricing in Hyde Park, you can find the account on Twitter at @hpavocadoprice.